Sarah is a graduate, prize-winner and Associate of the Royal Academy of Music and perfoms and lectures regularly in America, Australia, Europe and across the UK. Alongside her career in performing, her life-long passion for history has lead to her research into the history of the harp in England which has revealed a hidden dimension to the instrument's past. 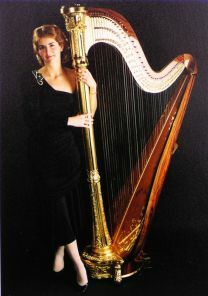 For many years she has studied and collected historic instruments and repertoire, and performed music for Medieval, Tudor and Regency harps, she has also restored several precious antique 19th century harps to performing standard and commisioned a reproduction of a very rare 'Royal Portable' Regency lap harp. 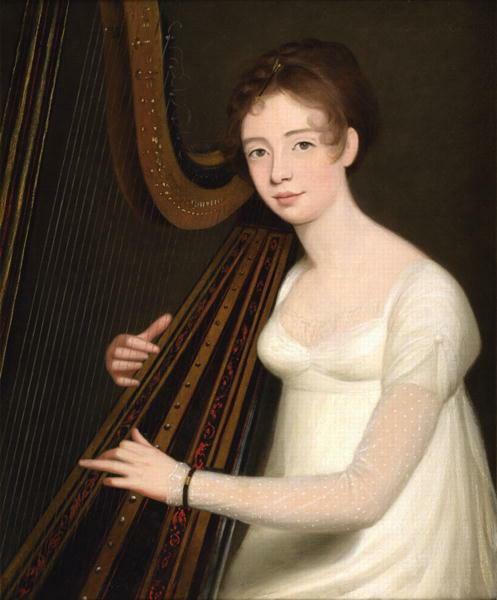 Sarah is also the primary authority on the very rare and uniquely English Regency period instrument - the harp-lute, - and after years of research is the only authentic player of this instrument. Her lectures on the harp include live music demonstrations on harps and other instruments depending on lecture subject. She can also provide 'hands-on' study days - please see below for details. Sarah is also a voluntary lecturer on behalf of The Woodland Trust. Please see below the variety of subjects offered for lectures, and email on the address given at the bottom of the page with any further enquiries. All lectures are in digital format. Using illustrations from carvings, wall paintings, pottery, mosaics, sculpture, stained glass, illuminated manuscripts, and 18th and 19th century art, Sarah traces the history of one of the world's most ancient and beloved musical instruments from thousands of years BC, to it's arrival in northern Europe, including the huge developments and improvements during the Rennaisence and 19th centuries that created the highly mechanised and beautiful instrument we see played in orchestras and as solo instruments today. Performing on her own reproduction and antique instruments, Sarah will demonstrate the development and evolving sound and repertoire of the harp throughout it's history. 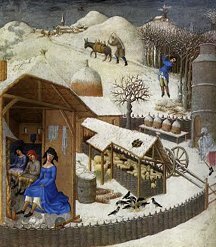 Using illustrations from illuminated manuscripts, readings from literature and contemporary accounts, and the haunting songs, carols and lively dance tunes of medieval England, Sarah brings alive the spirit of a Medieval Christmas- a time of joy and celebration for some, but hardship and suffering for others. With extracts from literature and manorial household accounts, she pieces together life in a medieval manor house at Yuletide. In addition to her reproduction medieval harps, she adds plucked psaltery, hurdy-gurdy, hammered dulcimer and gemshorn to the musical mix, performing carols, music and readings for an atmospheric and musical seasonal celebration. 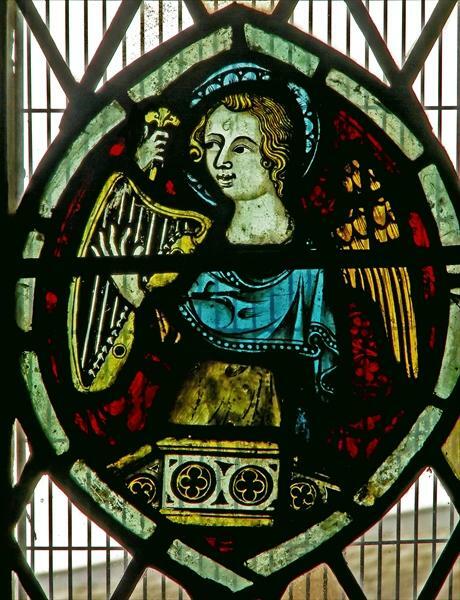 'Soft Angelic whispers' - The hidden history of the English Medieval Harp. Many people around the world today believe the harp to be an exclusively 'Celtic' instrument and are unaware of it's considerable presence in England since the 10th century. This lecture describes the many illustrations Sarah has collected over 20 years, from stone and wood carvings, illuminated manuscripts, stained glass and wall paintings. With the aid of the many references there are in literature and household accounts of the time, Sarah reveals the hidden history of this delightful instrument, and using her own reproduction medieval harps performs music and songs from medeival England. 'Thy Trembling Strings' -The 19th century harp and harp-lute. Using her own restored Regency pedal harp and the music of some forgotten English 19th century harpists, Sarah explains how the development of the double action pedal mechanism in 1810, lead to an explosion of popularity in the harp, which is further illustrated by the many beautiful portraits of Regency ladies with their harps, revealing how fashionable and elegant it was considered in England. Sarah's research has also lead her to discover the lost English Regency instrument the Harp-Lute, invented for harpists to use on their 'grand tour' but was abandoned by 1840. Sarah performs authentically on two of her restored harp-lutes as well as here original Erat Pedal Harp using original repertoire she has uncovered from museums, libraries and private collections. From Mediterranean Antiquity to the early European Middle Ages. 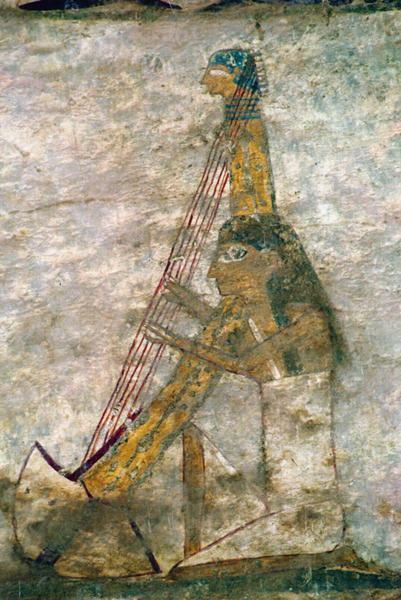 The ancient classical world is full of images of early types of harp, from the elegant bow-shaped harps of ancient Egypt, the right-angled harps of Mesopotamia and the quadrangular harps of ancient Greece. Using illustrations taken from wall paintings, sculpture, mosaics, pottery, and stone carvings, Sarah explains the fascinating history of these intriguing instruments and their journeys East along the Silk Road to Asia, and Northwards into Europe. Using her early medieval harp Sarah is able to explain the structural development of these early harps, and speculate how the triangular shaped harp which was born in Greece, came to arrive in the British Isles, where it has been cherished ever since. 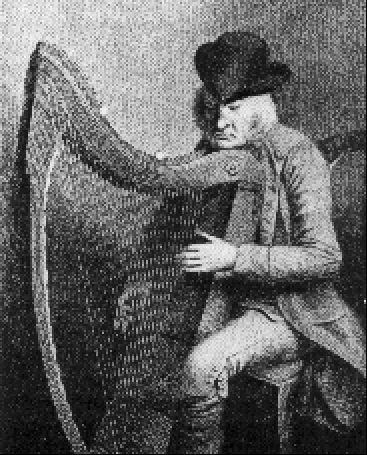 The fascinating story of the history and development of the harp in Ireland, Scotland, Wales and Brittany, how it differed from harps and their music in England and the rest of Europe, and how it evolved into a symbol of proud identity with political significance. Sarah illustrates this lecture with live music and songs on medieval, Regency and modern Celtic-style harps. 'The Medieval harp in Iconography' - examining the difficulties of using iconography in historical research, including a 'hands on' live visual memory experiment. 'The Decorative Harp' - examining the techniques, detail and traditions of decorating harps from the ancient classical world through to the present day. 'The Medieval Minstrel in Art' - How musicians are depicted and used in art during the middle ages and what it can tell us about the lives and status of the minstrels themselves. lectures are in most cases around one hour in duration, she uses a digital lap-top slide presentation for all of the above lectures, but can bring a projection screen for smaller venues if required.